The saying “big things come in small packages” as it relates to Ant-Man doesn’t just refer to the tiny titular super hero. It also speaks to the easy, breezy air surrounding another sturdy Marvel Studios stand-alone not distended by angst-filled demigods, interdimensional villains and overstuffed storylines. As ex-con Scott Lang (Paul Rudd) is being recruited by scientist Hank Pym (Michael Douglas) to assume the Ant-Man mantle, Lang asks why they don’t just call the Avengers to fix the apocalyptic problem du jour. “They’re probably busy dropping cities out of the sky,” Pym retorts. 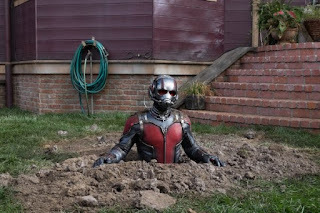 The tension between Ant-Man’s connection to and detachment from the Avengers ethos runs through both the film’s plotline and its production history. Edgar Wright, who wrote/directed Shaun of the Dead and the rest of his Three Flavours Cornetto film trilogy, and writing partner Joe Cornish worked on their Ant-Man movie treatment for over a decade. In mid-2014, Wright, also tapped as director, left the project due to creative differences. Enter Peyton Reed, the Raleigh, North Carolina native whose directorial credits include the pastel Down With Love and the Jim Carrey vehicle Yes Man. What remains is a self-contained heist film steeped in charisma and humor, with its toe dipped just far enough to integrate it into the overarching Marvel Cinematic Universe. During the film’s 1989 prologue, Pym—the original comic book Ant-Man created by Stan Lee in 1962—parts ways with Howard Stark, Peggy Carter and the rest of S.H.I.E.L.D., mothballing his subatomic research and shrinking serum in the process. Decades later, Darren Cross (Corey Stoll), Pym’s former protégé, is on the cusp of cracking Pym’s research and militarizing it. When Lang—a petty crook behind on job opportunities and child support since being released from prison—burgles Pym’s house, he only finds the Ant-Man suit. Pym decides that Lang is the right choice to become the new ant whisperer and stop Cross, despite the doubts of Hope (a remarkably buff Evangeline Lilly), Pym’s daughter, who has a contentious history with Pym following the mysterious death of her mother. In contrast to Marvel enemies motivated by Infinity Stones and sundry disfigurements, Cross is driven by pure greed and betrayal. He eventually dons his own Yellowjacket shrinking suit to wreak havoc, but there’s more palpable menace earlier when Cross zaps a disapproving business partner into a dollop of bloody tissue, which he blots with a tissue before unceremoniously flushing it down the toilet. At the same time, Reed maintains a deliberate distance with the danger. When Ant-Man and Yellowjacket engage in explosive combat atop a runaway locomotive, Reed pans out several times to remind the viewer that it’s actually taking place aboard a miniature train set behind propelled by a Thomas the Tank Engine. The levity runs through the supporting cast, from Douglas as the droll straight man to Lang’s buddies in crime, played by Tip "T.I." Harris, David Dastmalchian and a scene-stealing Michael Peña as Lang’s former cellmate. While Rudd’s comedic credits don’t suggest big action hero, the actor’s sardonic script contributions and wiseacre persona suit the film’s cheeky tone. Lang doesn’t crave hero status or even deserve it. He’s an everyman with a checkered past, overdue obligations, failed marriage and daughter he wishes he could see more. He also yearns direction in his life, something he’s unable to divine before Pym plucks him from rudderless obscurity. 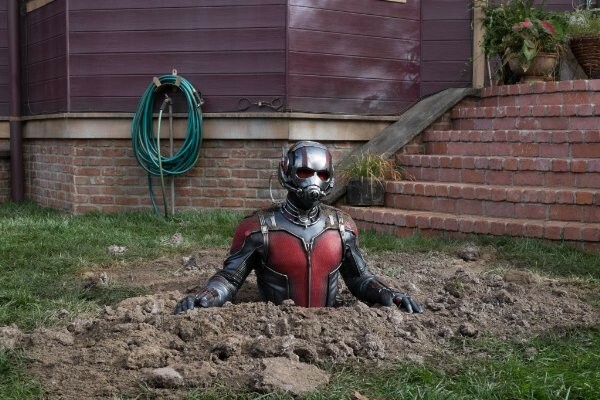 Ant-Man’s visuals are passable. Reed adroitly handles the action sequences, particularly Lang’s constant shrinking and enlargement. But Ant-Man’s miniature world evokes a Honey, I Shrunk the Kids pastiche, and the special effects rendering of Lang’s ant army reminded me of the 1954 nuclear monster classic Them! The seamless segue for Ant-Man’s eventual insertion into the Marvel storyline comes when he faces off with the Falcon (Anthony Mackie) while breaking into Avengers’ HQ to purloin some gizmo widget. There are also two teasers during the closing credits—one in the middle and one at the end—that preview a new heroine and how Ant-Man might feature in the next Captain America sequel. Until then, Ant-Man is a—dare I say—delightful origin story propelled by Wright’s wit, Reed’s light touch, and the wry delivery of Rudd, Douglas, Peña and the rest of the cast. Like an ant, the movie dutifully fulfills its entertainment obligations despite carrying a film franchise far above its weight. Labels: anthony mackie, bobby cannavale, corey stoll, evangeline lilly, marvel, michael douglas, michael pena, paul rudd, peyton reed, t.i.